The Art of Choosing: Analogous Color Schemes, a photo by jenib320 on Flickr. Today is all about Analogous color schemes! Analogous color schemes are very similar to the Harmonizing color schemes we talked about last week. They're simply made of 3 or more colors that are right next to each other on the color wheel! There are so many different combinations you could come up with, I'm only going to show you a few! 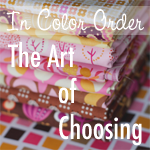 So, let's explore a few Analogous color schemes in fabrics! Now I'd like to share with you a project I made using an Analogous color scheme. Modified Nine-Patch, a photo by jenib320 on Flickr. Red (pink), Red-orange, Orange, Yellow-orange, Yellow: Modified Nine-patch mini quilt. Centered around Kate Spain Terrain print in the center! It seems like there are so many RIGHT combos. But my choices never look good, so hopefully at the end you will show some wrong combos and why they're wrong! I am working on a random, scrappy, analogous colour scheme based on blue from aqua to purple! I hope it works! I just want to say thank you for posting this series - it has really inspired me to learn more about color theory! Palette Generator is great because it allows you to upload a photo, select the area you want to focus on, then gives you not only the colors, but also the amounts of each used in that selection in a handy pie chart. I've just gone back to reread about the colour theories you had posted about and they are truly very helpful. Just a little thank-you from me because it's so good to find help when needed!